MoJo Promotions supply a first class catalogue of personalised administrator products, all designed to be custom printed with your brand. Administrator Products provide a superb way to advertise your design. The branding options found with personalised administrator products is ensured to ensure your marketing aspirations are met. Our collection includes - Budget Pocket Calculators to mention but a few. All of our products can be personalized to suit your wishes, please contact us for more information. 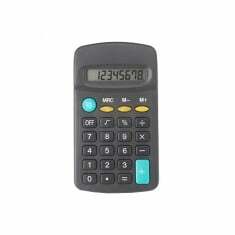 Never struggle with maths again with our custom printed Pocket Calculator with..